About a year ago in May 2013, Google launched Polymer.js. So here we are, a year later. And the question is: Is it yet ready for prime time? Is it yet possible to create a production ready application using Polymer web development techniques? To answer this question, I took Polymer out for a test drive to develop a web application and to see how well it would behave. This article is about that experience and what I learned in the process. Before we get into our Polymer tutorial, let’s first define Polymer.js, not for what it claims to be, but for what it actually is. When you begin to check out Polymer, you can’t help but immediately be intrigued by its self-professed unique world view. Polymer purports itself as taking a sort of back-to-nature approach that “puts elements back at the center of web development”. With Polymer.js, you can craft your own HTML elements and compose them into complete, complex web applications that are scalable and maintainable. It’s all about creating new (i.e., custom) elements that can then be reused in your HTML pages in a declarative way, without needing to know or understand their internals. OK, so that’s the theory. Now let’s take a look at the reality. While Polymer’s philosophical approach certainly has merit, it is unfortunately an idea that (at least to some extent) is ahead of its time. 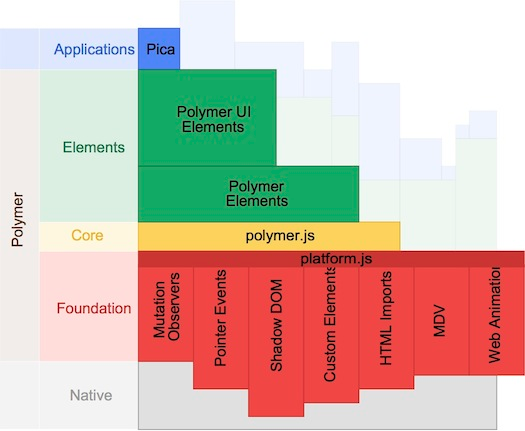 Polymer.js places a hefty set of requirements on the browser, relying on a number of technologies that are in still in the process of standardization (by W3C) and are not yet present in today’s browsers. Examples include the shadow dom, template elements, custom elements, HTML imports, mutation observers, model-driven views, pointer events, and web animations. These are marvelous technologies, but at least as of now, that are yet-to-come to modern browsers. The bottom line, then, is that we’re in a sort of limbo mode with Polymer, as it is ultimately relying on (or perhaps more accurately, approximating) browser technologies that don’t yet exist. Accordingly, Polymer.js today seems more like a study in how element-centric applications may be built in the future (i.e., when all the necessary features are implemented in the major browsers and polyfills are no longer needed). But, at least at present, Polymer seems more like an intriguing concept than an actual option for creating robust change-your-view-of-the-world applications right here and now, which makes writing (or finding) a Polymer tutorial difficult outside of Google’s documentation. Native: Needed features currently available natively in all major browsers. Foundation: Polyfills that implement needed browser features not yet natively available in the browsers themselves. (The intention is for this layer to disappear over time as the capabilities it provides become available natively in the browser.). Core: The necessary infrastructure for Polymer elements to exploit the capabilities provided by the Native and Foundation layers.. Elements: A basic set of elements, intended to serve as building blocks that can help you create your application. 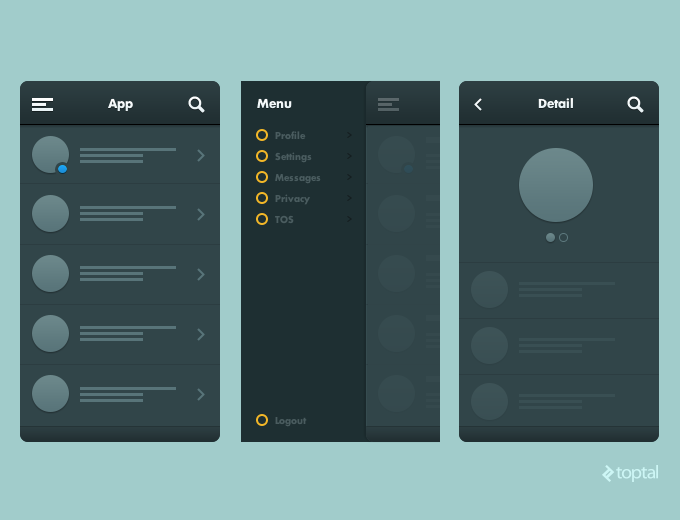 Includes elements that provide: Basic functionality like ajax, animation, flex layout, and gestures. 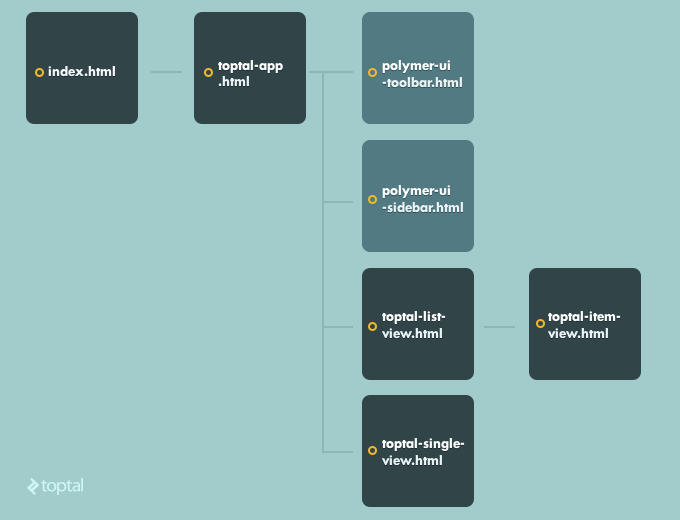 Encapsulation of complicated browser APIs and CSS layouts. UI component renderers such as accordions, cards, and sidebars. Polymer web development is all about creating elements, and is only about creating elements. So, consistent with the Polymer world view, our application is going to be… a new element. Nothing more and nothing less. Oh OK, I get it. So that’s where we start. For our Polymer project example, I’ll name the top-level element of the application , since custom element names (regardless of what framework you use to create them) must include a hyphen (e.g., x-tags, polymer-elements, etc.). The next step, though, requires quite a bit more thought. We need to decide on how we are going to componentize our application. An easy approach is just to try to identify, from a visual perspective, the components in our application and then try to create them as custom elements in Polymer. We can identify that the top bar and the side bar menu are not going to change and the actual “content” of the app could load different “views”. That being the case, one reasonable approach would be to create the element for our app and, inside that element, we could use some Polymer UI Elements to create the top bar and the side bar menu. We can then create our two main views, which we’ll call ListView and the SingleView, to be loaded into the “content” area. For the items in the ListView, we can create an ItemView. Now that we have our example Polymer application, we can insert it into any web page just by importing our “toptal-app.html” and adding the tag because, after all, our app is just an element. That’s cool. Moreover, your custom components are compatible with other custom element libraries (such as Mozilla’s X-Tag). So it doesn’t matter what you use to create your own custom element, it is compatible with Polymer and any other browser technology. It’s therefore not surprising that we’ve already started to see the advent of a community of Element Creators that expose and share their newly created elements in forums like the Custom Elements site. You can go there and grab whatever component you need and just use it in your application. Polymer is still sufficiently new technology that developers, especially novice app developers, are likely to find it to be somewhat brittle, with a number of not-so-hard-to-find rough edges. Lack of documentation and guidance. Not all Polymer.js UI and non-UI Elements are documented. Sometimes the only “guidance” on how to use them is demo code. In some cases, it’s even necessary to refer to the source code of a Polymer Element to understand better how it works and can/should be used. It’s not entirely clear how to organize larger applications. In particular, how are you supposed to pass singleton objects between elements? Which strategy should you employ to test your custom elements? Guidance on these types of issues at this point is scant at best. Dependency errors and version-itis. Even when you download Polymer.js elements as is recommended, you might find yourself with a dependency error, pointing to different version dependencies in the same element. While it is understood that Polymer Elements are currently under heavy development, these kind of problems can make development quite challenging, eroding developer confidence and interest. Problems on mobile platforms. Polymer.js performance on mobile platforms can often be somewhere between frustrating and problematic. Downloading the entire library and polyfills (without gzip’ing) is slow, and you need to download every Polymer Element that you intend to use. Processing the polyfills, libraries, and custom elements appears to be an expensive task on mobile platforms. Even when the downloading is complete, you still often have a blank screen for a few seconds. Especially for more complex functionality (such as drag-and-drop or rendering into a canvas), you may find that functionality that works fine on the desktop simply does not work properly, or is not yet supported, on the mobile platform. In my particular case, one such frustration that I encountered was with rendering into a canvas on iOS. Inadequate or confusing error reporting. Sometimes when you misspell an attribute name, or just break something related to the core layer itself, you receive a strange error message on your console with two call stacks that you need to investigate to try determine where the problem is. Sometimes it’s easy to solve this, but sometimes you end up needing to try a completely different strategy just to avoid the error since you can’t track down it’s source. Polymer is intriguing technology, but it is undeniably still in its infancy. As such, it’s not yet well suited to development of a large, enterprise level, production-ready application. Additionally, there aren’t many guides or tutorials available specific to Polymer.js web development. Perhaps most notably, Polymer requires a fairly significant level of expertise in using browser technologies like the DOM. You’re in many ways returning to the days before jQuery, learning the DOM API to do simple tasks like adding or removing a CSS class from an element. This certainly does make it feel, at least on some level, like you’re taking a step backward rather than forward. But that said, it does appear likely that custom elements are going to be an important part of Web Development in the future, so diving in sooner rather than later would probably be prudent for today’s web developer. And if you’ve never tried to create your own custom elements before, Polymer (and this tutorial) is probably a sensible place to start. Alejandro, great post, and thanks for the introduction to where the rough edges are. This is really helpful! If a moderately complex website needs some custom elements plain HTML+CSS+JS is a good choice (eg: Bootstrap tabs and accordions) and JS plugins are good enough (eg: jQuery UI sliders as input elements). A full-featured HTML app on the other hand will require some kind of framework. Angular, Ember, CanJS allows you to create custom elements without the additional weight. I don't find the selling points (shadow dom etc) convincing enough to use this library. Sorry for going off-topic, but what did you use to create that mockup (the second image in the article)? Looks really nice. Hi, This illustration have been made in the Adobe Photoshop. Aah. I thought there was a cool wireframing tool out there that could make wireframes that looked that nice. Nice work. It is always a pleasure read your posts. Congrats!!! Has compatibility issues with ajax requests on firefox? One does not simply... add or remove a class from an element without JQuery. Haha, anyways, thanks, great article. I don't understand why polymer wouldn't go the distance and support package managers like component or npm-browserify. ONLY using bower for package management seems like a great way to say "not really modular" because you can't actually just ship it ANYWHERE. Also, the concept of reusable web-components is being approximated/simulated pretty well in Ember, as... Components. They are working hand-in-hand with the spec to ensure compatibility when it's done. Bower already added dependency resolution, packaging and distribution and you can start a private registry faster than you can say bowerbird. The fact that you can bring your own build tools is considered a feature. It would be incredibly annoying if I pulled your seemingly independent package, but had to install additional tools and run additional commands before I could test the client-side sources. Perhaps it's time to revisit this question. I've successfully used it in fairly significant projects that target only chrome/chromeos with very few issues. I know others will want to target more than just chrome(os) just I'm curious where polymer stands these days, after another year. I am exploring more about Polymer, and this post is well done. Thanks for sharing your views . The Web is different, and I can see why programmers might have little tolerance for the paths it chose, but this time the programmers are wrong It’s not that the Web is perfect – it certainly has glitches. It’s not that success means something is better. one gotta love articles without publish date... oh man, why! why! whyyy!!!??? Hi, Alejandro. We met yesterday on the Toptal gathering in Cordoba. It was really interesting hearing you talk about Polymer and React Native so I'm certainly going to give them a try! !